Salem, OR—Governor Kate Brown today announced and discussed her upcoming attendance at the UN Climate Change Conference in Bonn, Germany. In advance of the conference, Governor Brown also signed two executive orders in Portland that move the state toward greater energy efficiency, accelerate the adoption of zero emission vehicles, and lead the state further toward fulfilling goals to reduce greenhouse gas emissions, all while supporting Oregon's economy. "In Oregon, economic development and environmental stewardship are not mutually exclusive goals," Governor Brown said. "The Paris Agreement is the best chance we have to create jobs, promote trade, spur innovation, and preserve American competitiveness in a 21st century economy. I'll deliver that message when I travel to Bonn and will continue to work with leaders on the West Coast, across the country, and around the world to address the challenge of climate change." 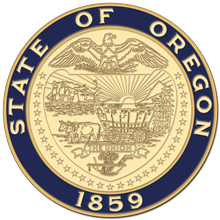 Next week, at the UN Climate Conference in Bonn, Governor Brown will highlight the economic development opportunities and jobs supported by green innovation and affirm Oregon's commitment to fighting climate change. Governor Brown is expected to be the highest-ranking woman elected official representing the United States at the climate change conference. She will be joined by California Governor Jerry Brown and Washington Governor Jay Inslee. Governor Brown was also joined by Portland Mayor Ted Wheeler, representatives of the International Brotherhood of Electrical Workers Local 48, and several green developers for the signing of the executive orders at the Field Office, which is a green commercial development project still under construction in Northwest Portland. The executive orders take steps to increase the use of clean energy and direct state agencies to develop a strategy to achieve net zero energy ready buildings as standard practice in buildings across the state. Energy efficiency is a critical and growing portion of the Oregon's clean energy economy, and maximizing energy efficiency in buildings is one of the best and least costly ways to achieve emissions reductions in the energy system.